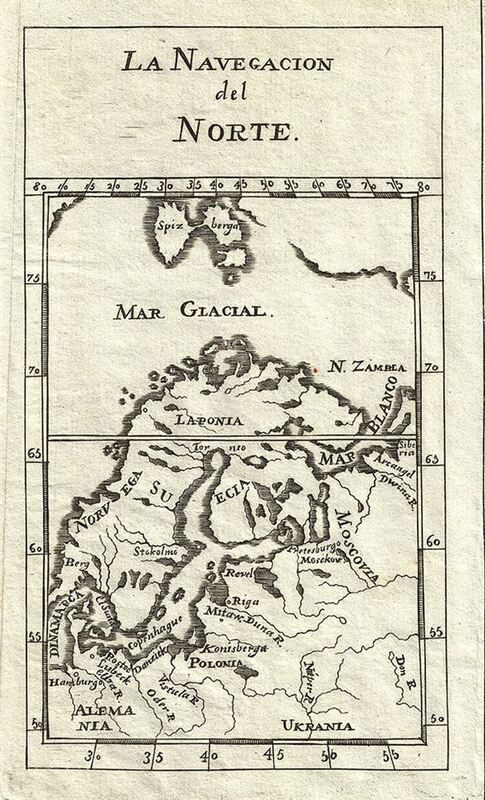 This is a scarce 1754 map of Scandinavia and the Northeast Passage. It covers from Svalbard (Spizberga) south as far as the Ukraine and from Denmark eastward to the White Sea and Russia. The Northeast Passage, much like America's Northwest Passage, was a long sought after sea route through the Arctic that would save European merchantman the expense of rounding Africa in order to access the trade riches of East Asia. This map deals primarily with Scandinavia detailing the Northeast Passage from Norway and Iceland westward. Knowledge of this area was, at the time, speculative at best and this is reflected in the map. The map shows a misshapen representation of Svalbard, while Nova Zembla (N. Zembla) is identified, but not mapped. Names major cities, rivers and territories across Scandinavia and parts of Europe. This map was originally prepared in French by Abbot M. Pluche and translated into Castilian Spanish. Engraved by Jose Andrade for publication in Volume VII, Part 4 of D. Gabriel Ramirez's Espectaculo de la Naturaleza, O Conversaciones a Cerca de Las Particularidades de la Historia Natural. Very good. Original platemarks visible. Blank on verso.